My husband and I travel a lot with our toddler. After doing numerous road trips, triathlon weekends and hotel stays, we got tired of lugging around our Pack-N-Play. Pack-N-Play’s definitely serve a purpose especially for babies under 12 mos. old, but we realized once C2 could roll over and move around without any worries of SIDs, that the Pack-N-Play could be replaced. The reason for the realization is we were taking our two week vacation to California and didn’t want to have fly with the Pack-N-Play. We already had a BOB jog stroller, Deuter Kid Comfort II Child Carrier, three suitcases and other baby equipment and if we could find something more compact and safe for C2 to travel with we were bound to find it. I did research and found two other viable options that we felt comfortable with other than the Pack-N-Play. From One Step Ahead travel bed bigger and cozier! One Step Aheads kids’ inflatable bed features a larger, fully-detached mattress, for snugglier sleepovers and easier linen changes. Soft and cushy, with a flocked surface and built-in safety bumpers. Pump and tote included. Coordinating travel blankets, linens, and accessories sold separately. KidCo’s PeaPod™ the travel bed that does it all for the on-the-go parent! The inflatable air mattress helps protect baby from cold, damp floors while providing a comforting place to sleep. Great for outdoors because of its UV protection and wind screens. Zippered panels allow parents quick and easy access to baby from virtually any angle. The slick, easy to fold design makes it ideal for storage and use anytime. Weighs 4.75 lbs. Ultimately, we chose to go with the KidCo’s PeaPod™ for several reasons. 1) It folded up and looked as if it would fit in our luggage, which it does. 2) There were better reviews from other parents. I read several parents say that the Tuck-Me-In Travel bed said their kids were rolling off the bed a lot. 3) Our son has never slept in anything other than his crib or his Pack-N-Play and I was concerned he would not sleep if he had the freedom to get up whenever he wanted. 4) I could zip him up and know exactly where he was at all times. 5) I recently read that toddlers loves small, cozy spaces that give them a sense of privacy and proprietorship. 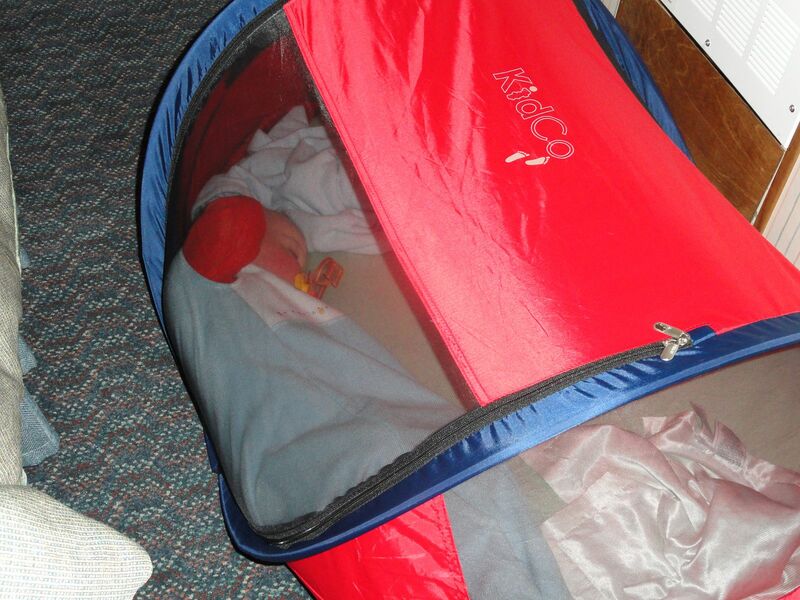 We purchased the KidCo PeaPod from Amazon about a month before leaving to go on our trip. Once we got it, we set it up in the living room for C2 to play in. He immediately loved it because it was something new and he could lay in it. Then a couple of days later, we put it up in his bedroom so he knew it was meant to be in there and it was his. Every day, he would go and lay down in it and play with it as well. We tried to put it in his crib to sleep in, but he was not having it; he screamed, he cried until we took the tent out of the crib. As you can well imagine, this caused me some concern and left me with an unanswered question of “what if he would not sleep in it when we were away?” My answer to this was, I know most hotels have cribs – if need be – to borrow. Although, they are not my favorite, if we had to “rent” one we would survive and so would C2. In order to make it more like home, I purchased a cradle sheet from Buy Buy Baby and washed it with C2 detergent prior to leaving for our trip. The cradle sheet fits perfectly with the little blow up mattress. The first night of our trip, C2 was extremely overtired. We had a long day on the plane (a very, new and exciting experience) with no nap and then a two hour car ride once we got to CA. So to say the least, our first night in the PeaPod (which, we call the tent) did not go so well. But, much to our surprise every nap and bed time from there on out, he went straight to sleep in it. That trip was 3 months ago and since then, we have traveled with it nearly 10 more times. C2 loves it and now knows it is his. It takes no time to set-up, no time to take down and it is a safe, special place for you little one. If your child is old enough, it might be time to trade in your Pack-N-Play for something lighter, more portable, and a cool, special place for your little one to sleep. Please note, I do not work for KidCo and I did not receive any of the products for free.